I was posed this question by my friend at Disney, who asked me (along with 532 other “mommy bloggers”) to participate in a unique stunt: to offer the premiere of the official trailer for the new Vince Vaughn movie on our websites. By now, y’all are used to me saying that I DO NOT shill. So, let me start this off by reminding everyone that I don’t shill and that I only write about or promote things of interest to me. Disney didn’t pay for this space and there’s no quid-pro-quo going on. I’m writing and posting this trailer because the topic is of interest to me and…really, if the trailer is an indication, this is a movie that’s got some serious promise. Before I get back to the question at hand, let me give a brief take on what “Delivery Man” is all about. Vince Vaughn (“Swingers”, “The Internship”) plays the lead – David Wozniak – a bit of a loser, a drifter, someone who doesn’t seem to have his act quite together and who is failing at his attempts to hang onto his girlfriend (Colbie Smulders – whose jumpsuit alone stole many scenes in “Marvel’s The Avengers”). Wozniak’s life takes a decidedly left turn when he’s informed that his decades-prior sperm bank donations prolifically spawned 533 children, 142 of whom are suing the sperm bank so they can find out the name of their dad. Wozniak then stumbles through trying to learn what it means to be a dad by playing “guardian angel” to some of those kids, against the arm-waving advice of his attorney friend, played by Chris Pratt (“Parks and Recreation”, “Zero Dark Thirty”). Clearly, the movie has some classic elements of the typical Vince Vaughn comedy – he pratfalls, he acts the oaf, he does things that make you wince and squirm in your seat because no well-adjusted person would do half of what he does. However, the movie also appears to have a strong emphasis on what it means to step up to the plate to be a dad, even when your family is as non-traditional as they come. 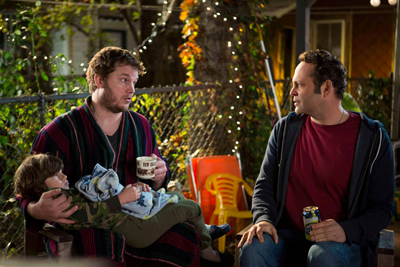 Pratt’s character clearly provides not only the voice of caution but also that of experience: playing a dad on-screen, he’s showing what the traditional dad figure looks like, which is a stark contrast to the converted dad played by Vaughn. Is this Vaughn’s shot to show he has range? I can’t truly predict whether this movie will be one-star or four, but I can say that it’s intriguing to see Vaughn try to branch out into something a bit more dramatic. This has the potential to be his “Truman Show”, which displayed Jim Carrey’s solid dramatic chops in a fashion that took seemingly everybody by surprise. Having seen Vaughn be ever so money in “Swingers” years ago, and loving him as the “EARMUFFS!” dad in “Old School” and Wes Mantooth in “Anchorman”, I’d like to see if he has some serious range. 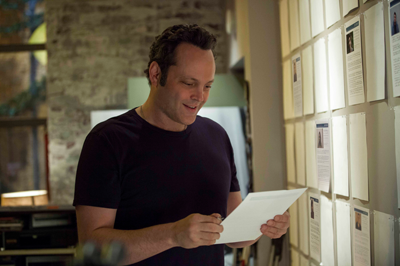 So, then, back to the idea of family…and this is where the whole Vince Vaughn piece really comes together for me. When you’re a parent, you can’t always be serious – it would be too exhausting. Kids want, need, and crave playfulness, humor and a sense that a smile is always around the corner. On the other hand, you can’t always just be a playmate – you have to provide structure and security, things that kids need but can’t create easily on their own. Family structures have evolved so much over generations, and the family image some people loudly deify as “traditional” isn’t even a century old. Go back hundreds of years and traditions involved families run by and around the mothers or grandmothers, families where multiple generations lived under the same roof, and families where children followed only in the footsteps of their father. Well, male children, at least. To me, family is whatever you make of it. It’s the people who support you and who love you, even when you’re driving them up the wall. Family doesn’t have to be one-man-one-woman. Families are based on love, not on chromosomal content. So, without any further ado, here’s the official trailer for Disney’s, “Delivery Man”, which opens in theaters on November 22, 2013. And before you get any ideas about taking YOUR family to see it, please note that it is rated PG-13 for mature themes, so it’s probably not appropriate for the smallest members of your brood. This entry was posted in movie reviews and tagged Chris Pratt, Colbie Smulders, Delivery Man, disney, family, movie, movie trailer, official trailer, Vince Vaughn by crunchymetromom. Bookmark the permalink.